Betty White's family moved to Los Angeles when she was about 18 months old. She began her career as "girl Friday" for the almost legendary Al Jarvis on Los Angeles' KLAC in 1949. When Jarvis quit the station in 1952, she took over as host. That same year she formed a production company, creating the sitcom Life With Elizabeth, and making White one of the first female TV producers. She had several more sitcoms, and was one of the first Hollywood starlets to earn the unofficial title "America's Sweetheart", but through the '50s and '60s she was more commonly seen on game shows. It was on the game show Password that White met the gentlemanly Allen Ludden. They married in 1963, making her the stepmother to his four children. The Luddens were friends of Mary Tyler Moore and her then-husband Grant Tinker, so during the fourth season of The Mary Tyler Moore Show, White came aboard as the sickly sweet nymphomaniac Sue Ann Nivens. 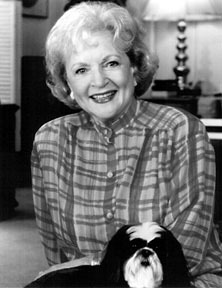 After that, she starred in her own Betty White Show, and in 1985 she was cast as sweet, ditzy Rose Nylund in The Golden Girls. Since 2010 she has starred on Hot in Cleveland. She continues to appear on TV and has attained an unexpected "it girl" vibe in her latter years. Still sharp at 88, she won her seventh Emmy hosting Saturday Night Live, playing up her age with incongruous sexual punchlines. White is also known as an animals' advocate. She has served on the Greater Los Angeles Zoo Association Board since 1974.